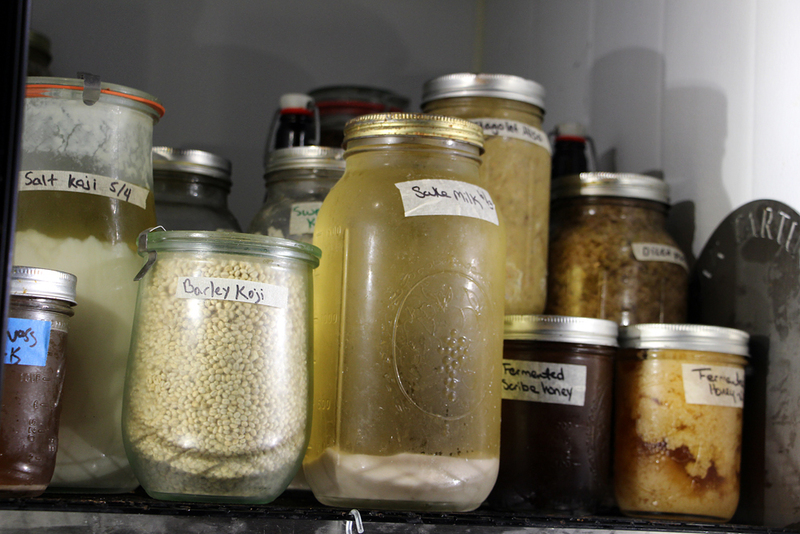 Cortney Burns and Nicolaus Balla could be considered major fermentation geeks. 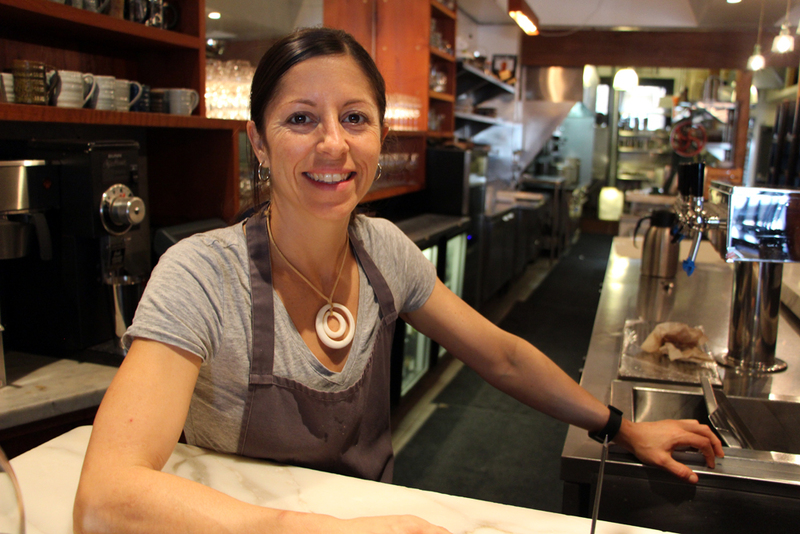 As is evident to anyone who has eaten Bar Tartine's border-crossing food – heavily influenced by Hungary and Japan, but with other culinary influences, too – or seen their new cookbook, Bar Tartine: Techniques and Recipes (Chronicle Books) the chefs have exponentially more projects going at any one time than most. 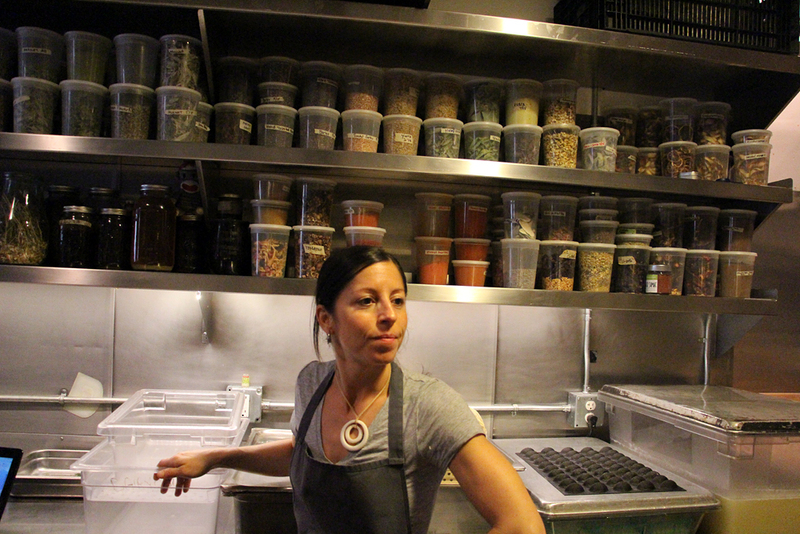 So when Bay Area Bites asked for a tour of their pantry, we were thrilled when they said yes. Just to give you an idea what’s inside: house-made Asian fish sauce, kimchi made from fiddlehead ferns, fermented almonds, pickled green walnuts, sakes that are being turned into vinegars, several varieties of fermented honeys (fermenting honey gives it a bit of acidity and more complex flavor; honey will ferment above a certain temperature and if it’s above a certain moisture content), coriander seeds and elderberries that are salted and brined like capers – since capers don’t grow locally, they pickle other seeds and berries to make them taste like capers, a two month process – preserved lemons, pepper pastes made from thousands of pounds of Hungarian peppers, blood orange vinegar, three year old umeboshi (Japanese sour) plums (“We did a huge batch three years ago, and haven’t had to do anymore in the past few years,” said Burns), several kinds of miso and koji. Their miso is house-made, and comes from their house-made koji, which is made by inoculating cooked grains or legumes with a fungus. 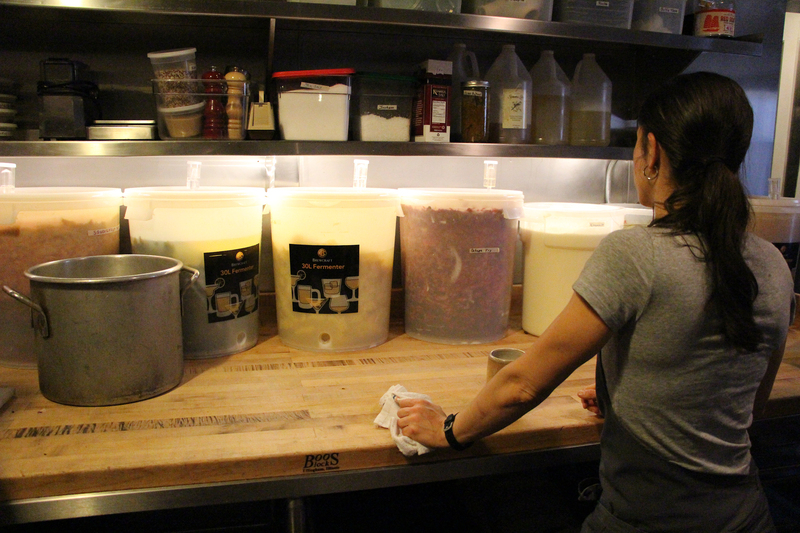 They always have koji made from several types of grains fermenting at once. Pickled green walnuts are made from unripe whole nuts. Once pickled, they become like dry, black olives in texture, with a flavor similar to pickled artichokes. Fermenting them is a several month-long process, in which they are submerged in several types of brine with honey and malt vinegar. 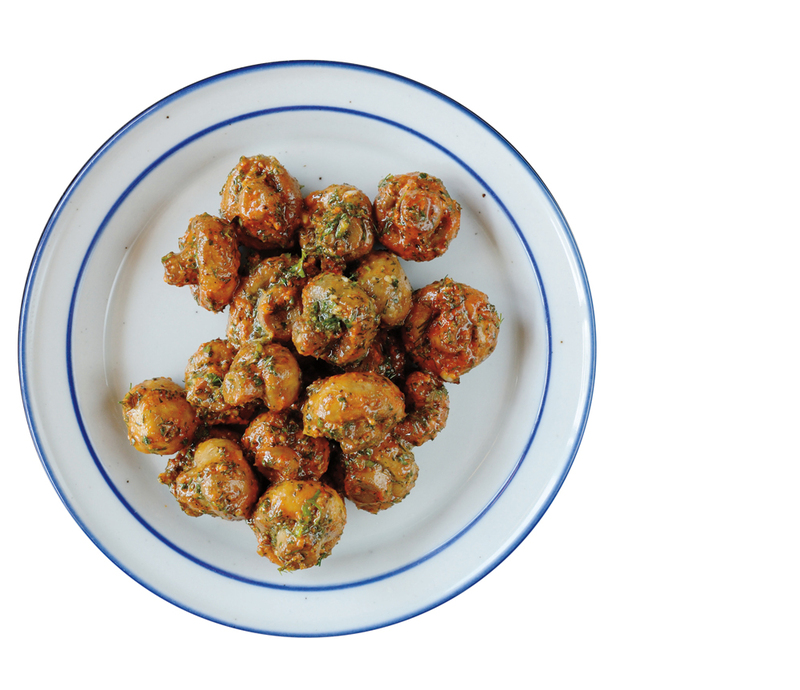 In the cookbook, Balla and Burns say they use them in their sweet potato salad, but that they pair well with olives and blue cheese. 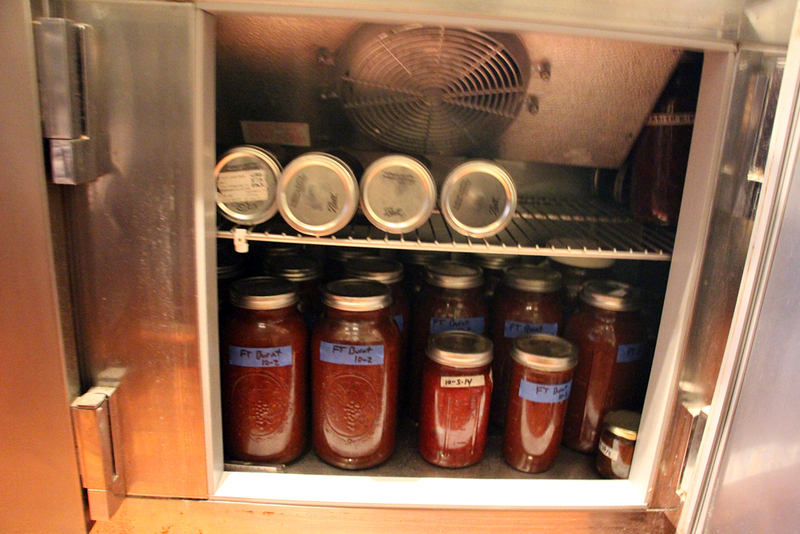 There were also two sodas in their secondary stage of fermentation, sumac and honey ginger turmeric. They source very few products from far away (ramps, sour cherries and bottarga, or Mediterranean cured fish roe, are a few), but sumac is another; on a visit to Madison, Wis., where Burns went to college, they were at the farmers' market and came upon a farmer selling the fruit, which is most often ground into a sourish powder to spice up Middle Eastern cuisine (fans of the Yotam Ottolenghi books will no doubt have it in their pantry). The farmer shipped some to Bar Tartine, where they soaked the stems and pods in warm water to extract the tannins. Later, they added whey, a byproduct from their house-made yogurt, and apple and pear juice with a bit of honey for sweetness. Fermenting causes natural carbonation to occur, resulting in a refreshingly sour soda. Their honey ginger turmeric soda is made from a probiotic non-dairy kefir (kefir is usually a fermented milk product) made with fresh turmeric grown in Sebastopol. In another section, there is their house-made farmer cheese, butter from kefir, yogurts and sour creams. Another unusual find: carrot caramel, which is made from slow cooking carrots for 12 hours, caramelizing them in honey, which they use for carrot cake. Leaving that fridge, we turned the corner into the main part of the kitchen, where Burns was most excited about a jar of their house-made paprika. While they had been drying and dehydrating their own peppers to make the pungent spice for years, they found that nothing they did could match the flavor of paprika from Szeged, a region of Hungary known to have the best. Especially important is the essential oils found in the peppers from the region. Some years ago, with help from Balla’s mother and step-father, who were visiting, they deseeded pounds of Hungarian peppers, and gave the seeds to Juston and Mindy Enos of Full Table Farm in Yountville, who were already growing food for the restaurant. Now, they have locally grown paprika made from peppers in Yountville: “It’s better than the Hungarian stuff we were getting,” Burns said. In addition to the various paprika, we were wowed by the various jars of powders. 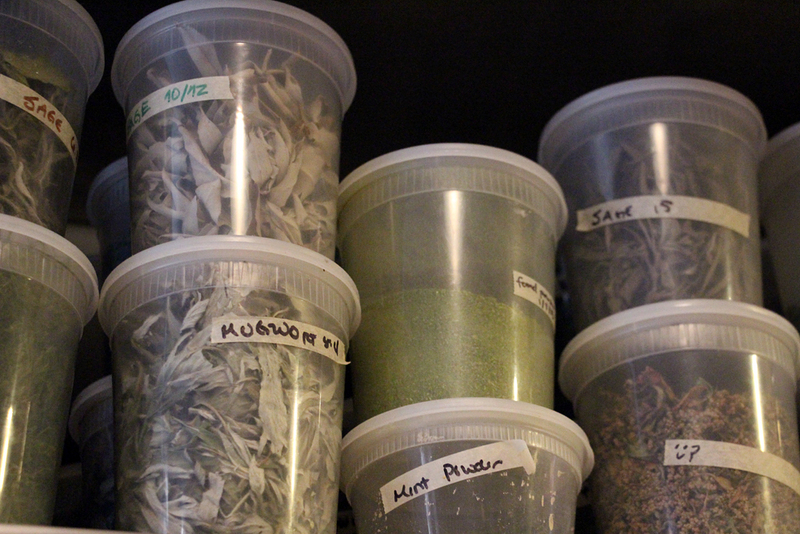 As anyone who has seen the cookbook knows, these chefs take their powders extremely seriously. Several pages are devoted to how they make them, with six pages devoted to the allium family alone. The items are usually dehydrated (timing varies, it depends on what the vegetable is and its water content), and then ground into a powder, which is then sprinkled into a recipe to add layers of flavor. The allium family includes: charred green onion powder, green onion powder, sweet onion powder, smoked onion powder, black garlic powder, and green garlic powder. 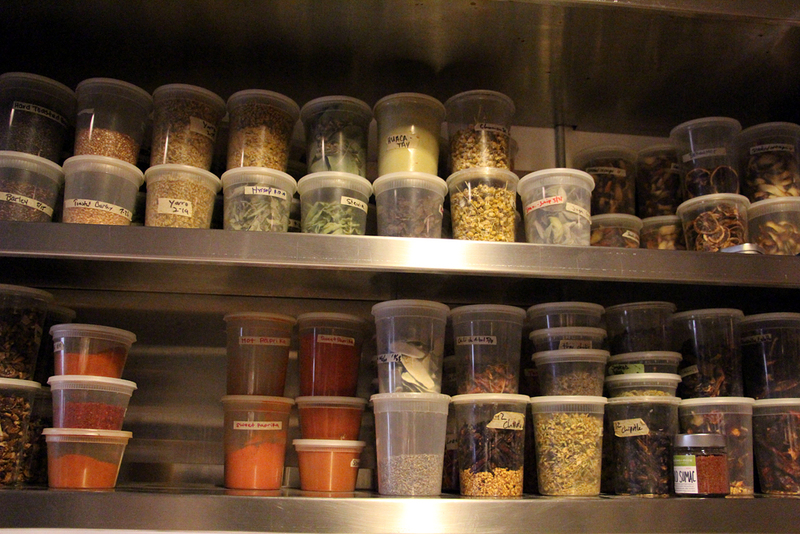 They mostly go into soups and stews. Yogurt powder gets added onto a wilted kale dish, “it brings in an acidic lactose aroma, and is mainly there for acidity,” Burns explained, while sauerkraut powder functions like salt, but with a built-in hint of acid, too. Other vegetables like mushrooms end up in powdered form as well; parsnip powder is in heavy rotation, due to the fact that the chefs prefer not to use refined sugar in their desserts. Given parsnip’s inherent sweetness, parsnip powder is their go-to to be sprinkled on desserts to add sweetness rather than powdered sugar. One section is devoted to flowers and herbs, some of which are used in their teas, and some in their food, like elderflower, for example. While they try to get almost all their spices grown for them locally, of course they have to rely on a few commodity spices, black pepper and coriander are two. “We’re trying to get someone to grow a pepper tree, but we’d need a field of them with how much we go through,” Burns joked. 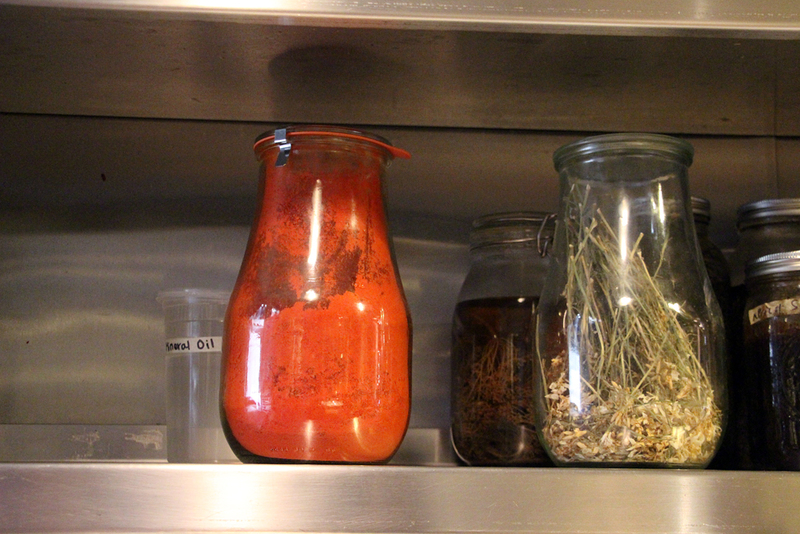 Then there is the sprouting section, where a variety of legumes are sprouting, and nuts are soaked to make nut milks. 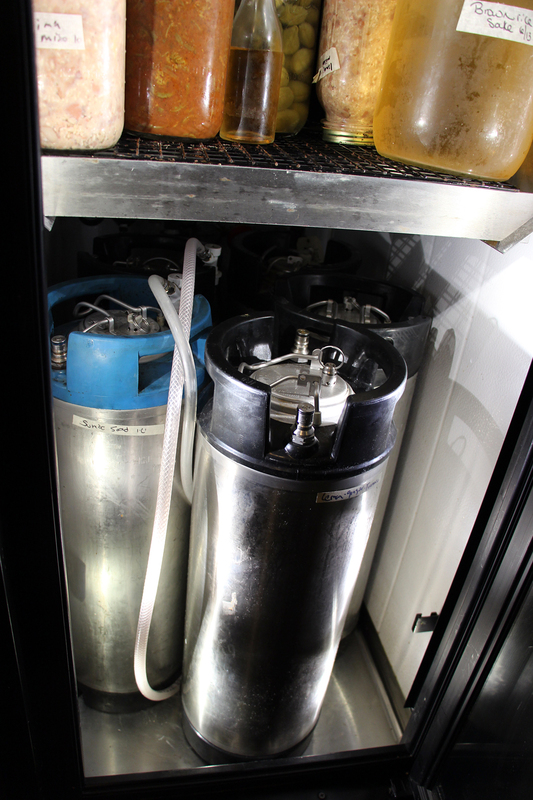 Along one wall of the prep area are their multi-gallon plastic fermentation tubs. We saw a melon juice made from water kefir that will eventually be turned into a soda or sauce; kefir cream, which will be turned into butter and used in a sauce; red cabbage kraut and whole green cabbage leaves. We saw a green cabbage kraut with horseradish, and one made from mustard greens. One tub held pickling carrots and radishes, and another held a kraut made from Brussels sprouts. Back in another small fridge, we saw jars upon jars of various chile pastes, another condiment they take very seriously. “Chile pastes are one of our passions,” said Burns. Again, in the cookbook, a section on pepper pastes features sweet, charred, chipotle and Southeast Asian sambal styles. Peppers are first cooked or smoked and then pureed with salt. After fermenting for over a week at room temperature, they are dried in a dehydrator or low oven for 12 to 16 hours, resulting in a tomato paste-like consistency. Then the paste is pureed, and left to mellow in a refrigerator for at least three months, though it’s even better after six. While there were jars of preserved lemons and limes on a shelf overhead, we also saw jars of a lime-pickle condiment in the fridge. A variation of the South Indian achar lime pickles, they preserve limes with spices like fresh turmeric, dill, coriander, caraway, chiles, garlic and lime juice, and leave it to ferment for several months. To make the limes into a condiment, which they serve with their whole grilled eggplant or pureed and rubbed on grilled meats, the preserved limes are steamed and then cooked with onions, garlic, chiles and honey until it resembles a paste. That is then refrigerated for up to six months. 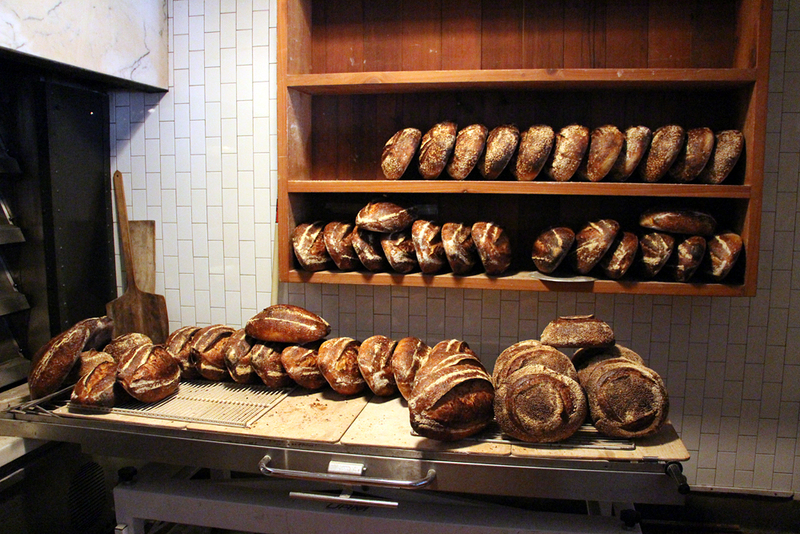 At the very back of the kitchen is the wood-fired oven, where Chad Robertson of Tartine Bakery, fires his famous loaves for the restaurant. If only that smell could be bottled or infused into this web page; the photos will have to do. Up at the bar, we saw a few soju infusions. Bar Tartine does not have a liquor license, but because the Korean spirit soju (made from rice) has less alcohol than traditional spirits, they infuse it themselves to make various cocktails. 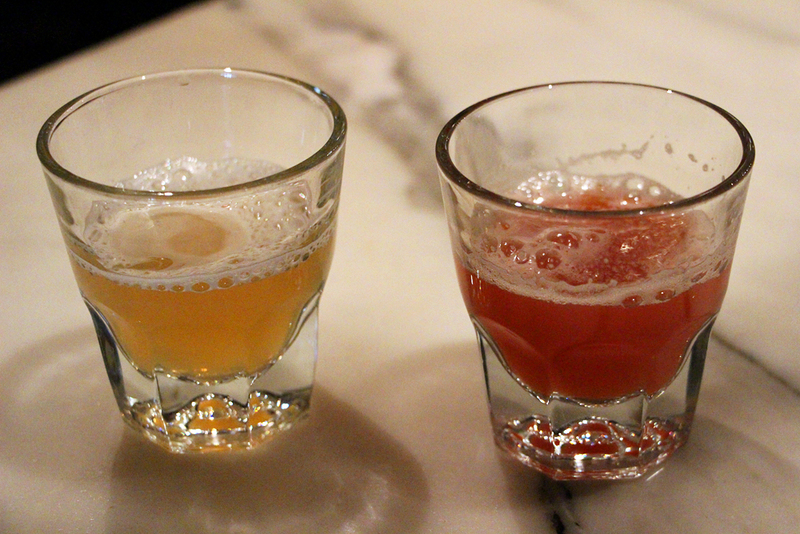 For example, one is infused with buddha’s hand, a citrus, and another with parsnips. 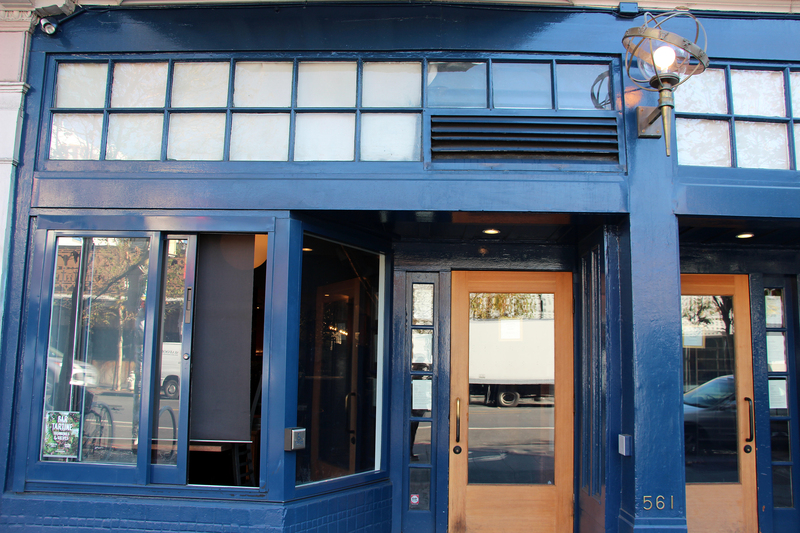 So when asked whether they keep a master list of all of their various kitchen projects at Bar Tartine, Burns laughed. 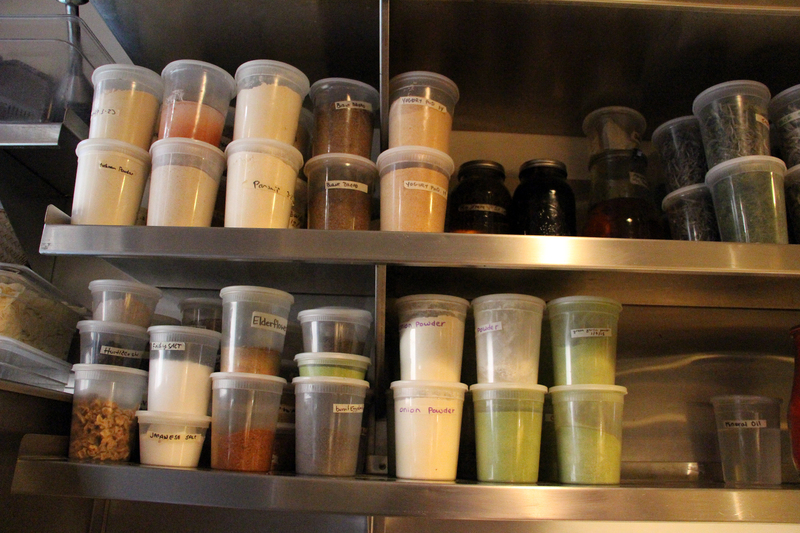 It’s this kind of experimentation that keeps the food at Bar Tartine so innovative. And if this article has inspired you to get fermenting or powdering, there’s one thing to know before you begin. 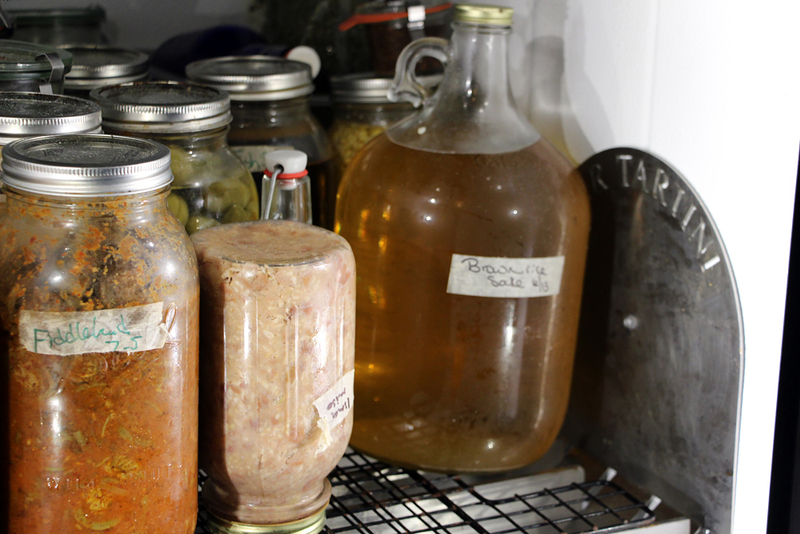 Many people assume that preserving or fermenting is a great way to use food that is on it’s way out or was not that great to begin with. Big mistake, Burns warns. Vegetables headed for fermentation can be cosmetically challenged, she said, but they must taste as good as their better looking cousins. And while many of these projects may seem way too daunting as well as unrealistically labor-intensive for the home cook, Burns said that many of them are much easier than they look. We see versions of these pickles in Russian markets and in Italian delis. Both types are equally addictive. We make our version with lots of paprika, which gives it a strong Hungarian accent. The draw of this dish is the combination of the savory garlic-laced paste that coats the outside and the sweet-and-sour, almost-creamy-textured inside of the button mushroom. This pickle is great to have on the table with all kinds of meals and with the Liptauer dip. Preheat the oven to 350°F/180°C. In a large roasting pan, combine the mushrooms with 1 tbsp of the oil and 11/2 tsp of the salt and toss to coat. Roast until tender, about 10 minutes. In a large bowl, combine the vinegar, garlic, parsley, marjoram, paprika, brown sugar, onion powder, garlic powder, lemon zest, pepper, and the remaining 11/2 tsp salt and mix well. Add the warm mushrooms and stir and toss to coat the mushrooms evenly. Chill the mushrooms completely in the refrigerator before serving, about 2 hours. 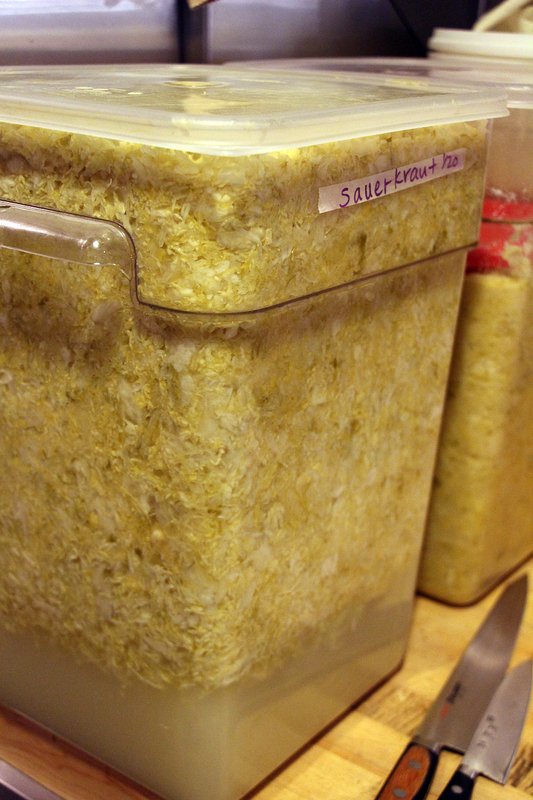 Transfer the mushrooms and brine to one or more nonreactive containers and refrigerate for up to 1 month.